Migratory birds of the Western Hemisphere, many of which will stop in Ohio as part of their incredible journey south for the winter, was the focus of a talk by Chris Tonra, assistant professor of Avian Wildlife Ecology in the School of Environment and Natural Resources at last week’s Columbus Science Pub held on the patio at COSI. 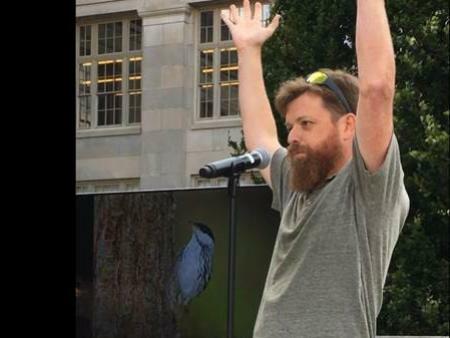 The talk, The Feathered Superhighway Over Our Heads, was featured in the August 23rd Columbus Underground article, “OSU Professor Discusses Ohio’s ‘Feathered Superhighway’ at Columbus Science Pub” written by Jesse Bethea. Tonra teaches a number of courses at The Ohio State University and provides leadership for research initiatives that seek to understand the full annual cycles of migratory birds in order to inform their management and conservation. He recently authored a biographical section on Margaret Morse Nice, a famous ornithologist who did her seminal work on the Song Sparrow right here in Columbus, Ohio on the Olentangy River in Ornithology: Foundation, Analysis, and Application, an upcoming textbook aimed at undergraduate and graduate students. Tonra also advises the Ornithology Club at The Ohio State University.